A solution-oriented magazine serving the 2-year and 4-year college/university market. Editorial features practitioner-based articles, topical supplements and special reports that focus on Facilities, Safety & Security, Technology, Business and Finance and the Campus Scene. The latest information, designs and industry news. 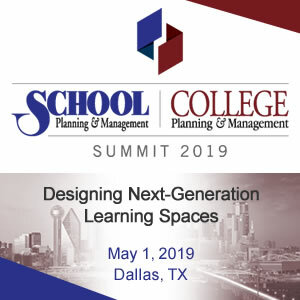 A quick look at timely news, need-to-know facts and figures, industry events, announcements and products affecting those who plan, design, equip, maintain and operate facilities for higher education. A solution-oriented magazine for professionals serving the K-12 education market. Editorial features practitioner-based articles, topical supplements and special reports that focus on Facilities, Safety & Security, Technology, Business, Finance and the Learning Environment. A quick look at timely news, need-to-know facts and figures, industry events, announcements and products affecting those who plan, design, equip, maintain and operate pK-12 learning environments.